Cat-scratch is a gram-negative bacteria infection transmitted by the scratch or bite of a healthy cat. The most common ocular manifestation is neuroretinitis. It usually presents unilaterally, is painless, and gradually impairs vision after about a week. 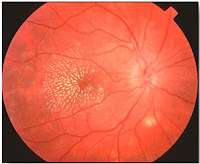 The optic nerve may be swollen and there may be macular edema. There also may be venous engorement and splinter-shaped hemorrages. A macular star of hard exudates forms. The visual acuity improves after over months as the optic nerve swelling then the exudates resolve. Treatment is with oral doxycycline or erythromycin w ith or without refampicin.